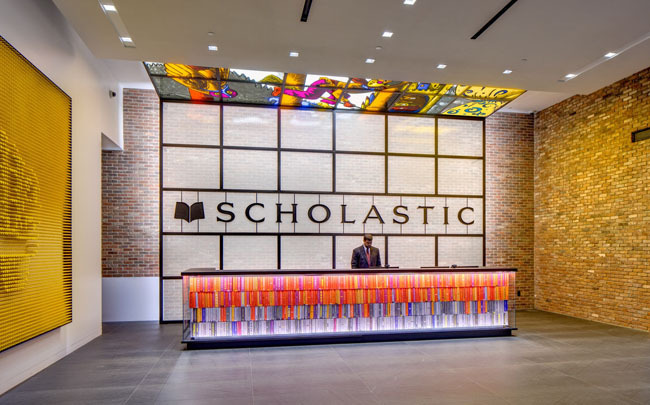 Scholastic is the world’s largest educational publisher and distributor of children’s books, home to Harry Potter, Clifford the Big Red Dog and Captain Underpants. 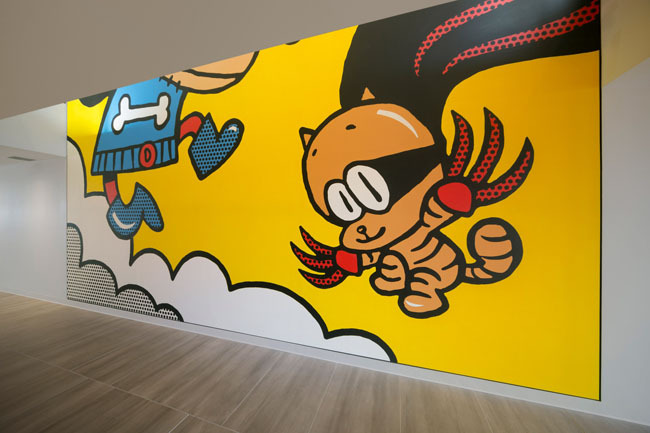 Pentagram has created an ambitious environmental graphics for the publisher’s corporate headquarters in New York City that reimagine the iconic characters in a series of large-scale artworks and installations. The new front desk, for example, is an illuminated 18-foot long “magic bookshelf” built of 800 books that appear to float in air. 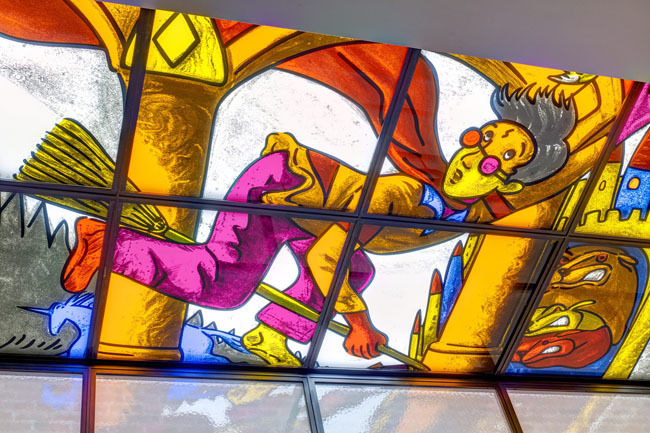 Above, JK Rowling’s Harry Potter floats in a colorful grid in the painted-glass style of UK artists Gilbert and George. 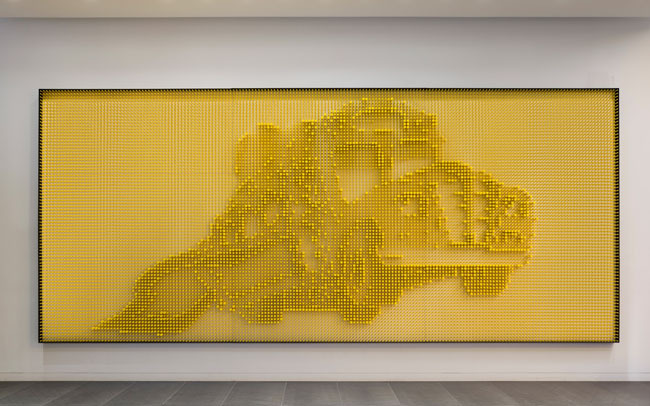 Nearby, the Magic School Bus is rendered as a dimensional pegboard made of 15,000 yellow wooden dowels. 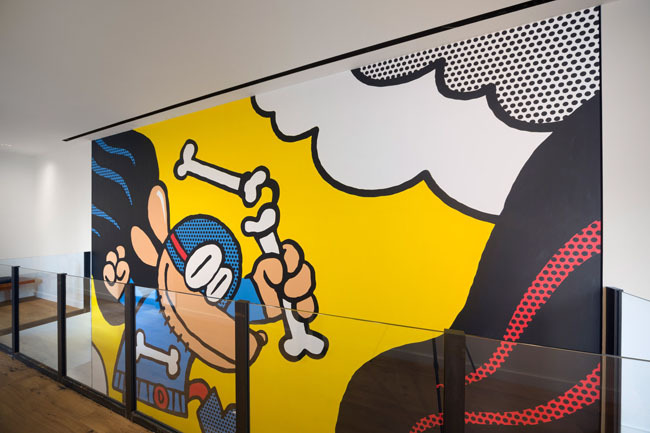 A giant, three-dimensional Captain Underpants smashes through a wall, and crime-fighting duo Dog Man and Cat Kid appear in a two-story mural painted in the pointillistic Pop Art style of Roy Lichtenstein. 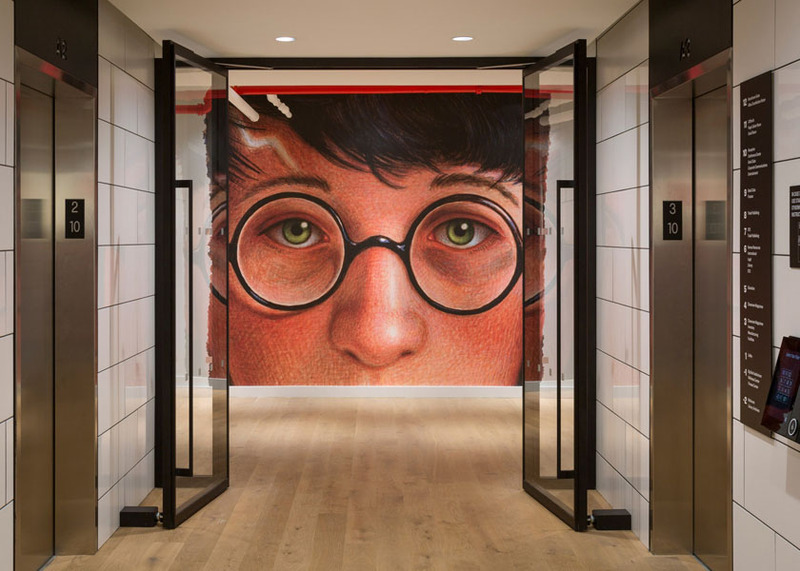 Clifford the Big Red Dog, one of Scholastic’s biggest stars, appears in 7 -foot tall murals in the elevator banks of each floor, made of stretched canvas sewn with fur. The program is part of a new renovation that updates the interiors of the headquarters, which were designed by the postmodern architect Aldo Rossi in 1994. 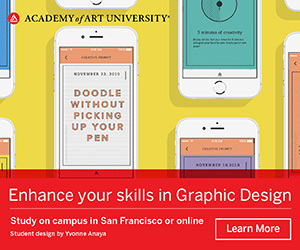 The Pentagram team working under partner Paula Scher, includes associate partner Rory Simms, former associate partner Courtney Gooch, designer Joy Wu, and project manager Sarah McKeen.